...the teacup makes that shot. I have a thing for tiny tea sets... I actually have one that's even smaller! Hansel is too cute, but I think he needs a bit of a haircut! 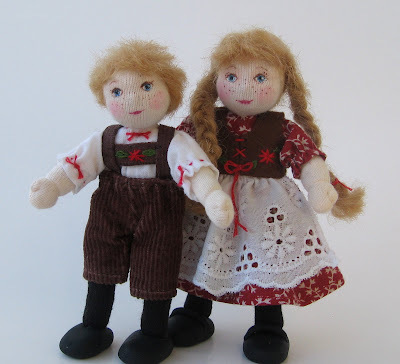 The way that wool relaxes always makes dolls need a trim after a day or two. It is unbelievably gorgeous out today and I spent the morning digging and planting my vegetable garden. So now I'm going to make myself a big iced coffee and after spending a few minutes admiring my work, I'm going to curl up in a sunny spot like one of my cats and have a bit of a snooze...I LOVE weekends! 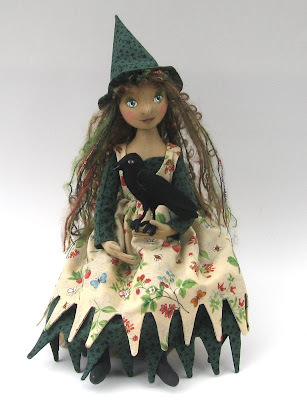 I have at last finished the first of my storybook dolls. Little Red Riding Hood, in her signature outerwear of course. I put a lot more detail into the face then I usually do on these small dolls and I'm so pleased with how she turned out! She's only 5" tall from the tip of her hood to the soles of her little mary janes. The Story of Little Red Riding Hood has undergone some amazing transformations over the years. In the older versions the heroine saves herself with her intelligence and quick thinking, but in the later versions, including Perrault's, she is completely witless and of course has to be rescued by a man. For a fascinating article on this process and some analysis of the story read Terri Windling's marvelous article over at the Endicott Studio. 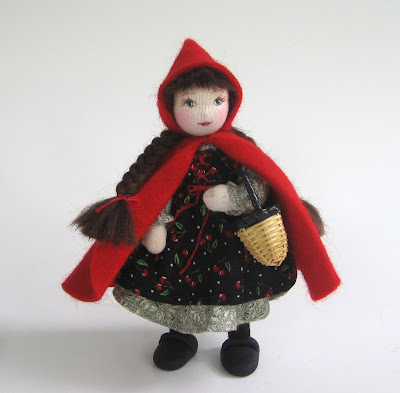 While I was never that fond of the story as a kid, having access to only the latter version, I have always had a soft spot in my heart for Little Red Riding Hood dolls. When I was about 5, I had a handed down Ginny doll that had a red riding hood outfit, and this doll was one of my all time favorites. We called her Luleela, which I think came from my baby sister's pronunciation of the story, and I played that doll to death, losing all her clothes over the years and most of her hair as well. Today she is put away, waiting for the time when I can restore her to some of her faded glory. 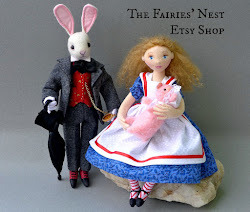 More storybook folk will be arriving soon! 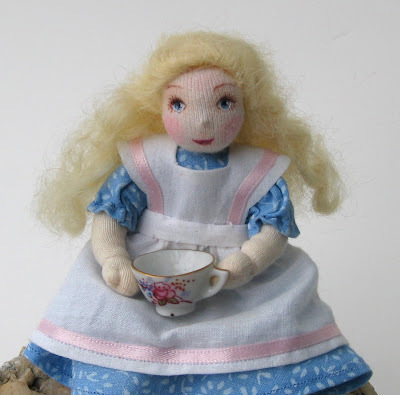 Up next...Alice, of course! As you may remember from my last post, all has not been peaches in the Fairy Nest lately, so I decided to take the advice of Kristen of KnitSteel and try my hand at a smaller project as a change of pace. ( Kristen is an amazing metal artist and you should really check her shop out, it's full of marvelous pieces!) I had been reading about creating felt from old sweaters and decided that here was my chance to give it a try. First, since I didn't have any decrepit sweaters on hand and my hubby can't wear wool, I needed some supplies. Happily a large mound of stuff hanging out in the living room waiting to be taken to Goodwill proved to be the way to tackle two objectives at once and off to the Goodwill store we went. Once there I found several 100% wool sweaters that were just asking to be felted... a couple were pretty moth eaten and the others were stunningly ugly designs so you can see what I mean. Of course my significant other found a couple of wonderful shirts to add to his wardrobe as well so everybody came home happy indeed. Next the felting. I put each one into a pillowcase, tied it up and threw them all in the washer in HOT water. When they came out they didn't really seem felted enough so I threw them in again. (Next time I'll just reset the agitator to run twice.) 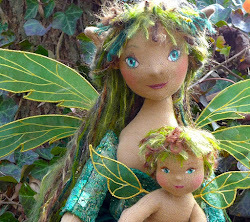 Now they were felted! I read that you're supposed to let them dry flat but I'm the immediate gratification type so I just threw them in the dryer. Wallah, Felt! Beautiful thick gorgeous colored felt! 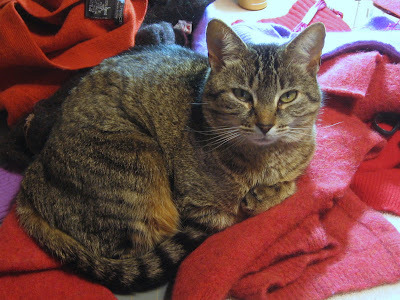 My cat Lilith is a wool addict so as you can see she was very pleased that I've taken on this new endeavor. I wish I could capture the colors of the felt better, the picture really doesn't do them justice. I was particularly pleased with a lovely dark orange that will make perfect pumpkins for Halloween fairies next fall. Awesome, since I can never seem to find that color anymore. Next I had to figure out how I was going to use these lovely pieces of felt. 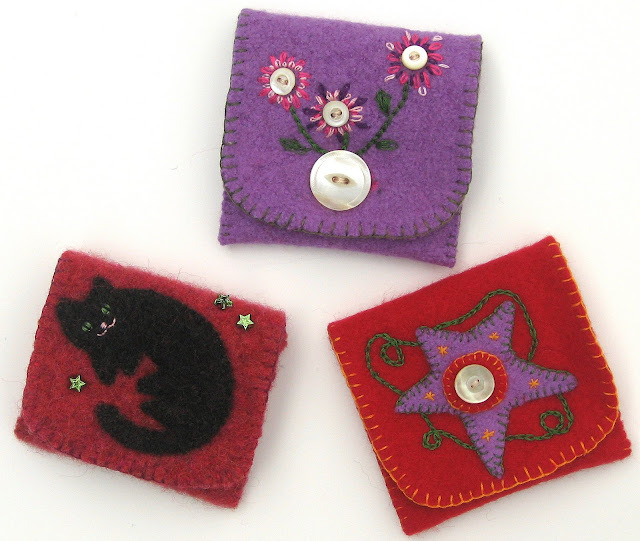 I immediately thought of the little wallets from Sally Mavor's book, Felt Wee Folk, that we used to make in the handwork classes I taught 5-7 year olds. So I made one using a lovely variegated pink for the background and a brown with multicolored highlights for the kitty. It came out so well that I decided to make up some new patterns of my own using some of the old shell buttons I inherited from my grandmother (who never got rid of any old clothing without cutting the buttons off first). I also had some antique looking snaps from the same stash so I used those as well. (Yea, recycling is a family trait. We're the people carefully unwrapping our presents at Christmas so we can reuse the paper! You'd be amazed at how much fabric I salvage from old clothes.) I was thrilled with how they turned out, what do you think? 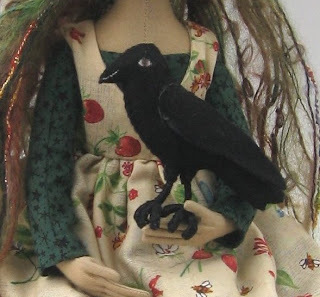 These two are a good example of a doll taking over in a good way...I was actually going to give her a cat to hold, and even had it all cut out, when I realized that what she really needed, and indeed wanted, was a crow. Now I, a known crow lover, was certainly not going to argue with her about this notion...besides arguing with a doll never gets you anywhere, they won't argue back and if you're heard people think you're crazy so the doll always wins... Of course it meant I had to figure out a pattern for a crow but even that went surprisingly quickly and before I knew it, there was Dante! And if you'd like, you can find more pictures in my shop. 1. My favorite colors are green and red, both in jewel tones. 2. I have major stomach issues and can't eat lots of things...in a perfect world this should mean that I am skinny but alas...not. 4. I live with all guys so there are very few bodily function jokes that I have not heard...and newsflash guys, they're REALLY not that funny! 5.I am deathly afraid of vampires...okay so they're not real, I still don't like them. Ask my sister about a traumatic movie experience in the 70's. 6. I don't ever pass on tags. I am always the weak link in these things! Please NO MORE TAGS...or at least come up with a new one! 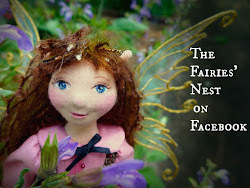 So that wraps up another exciting post from the doll front...hopefully things are now back on track and The Fairies' Nest will be seeing lots more new characters in the days to come. 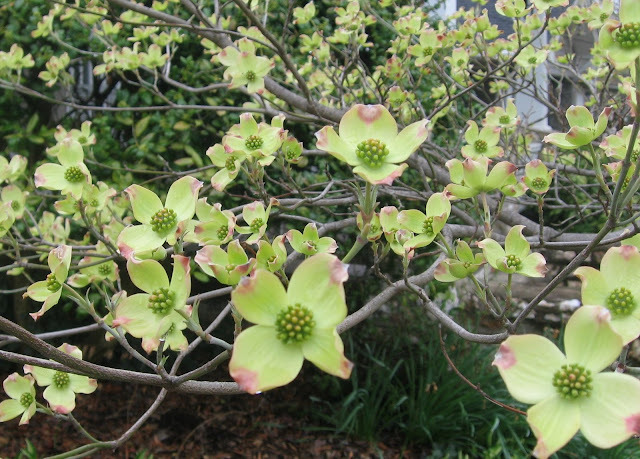 The Dogwoods in my neighborhood are at my favorite stage of bloom. They're still small and the petals have a pale greenish, rather ghostly color. In a week they'll be bright in their bold pinks and bridal whites but right now they have a soft, otherworldly look as they bloom on the ends of leafless branches.